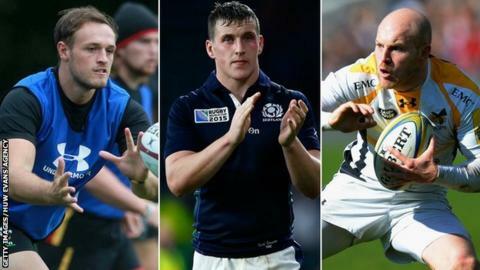 Great Britain Sevens have named 15-a-side internationals Cory Allen, Mark Bennett and Joe Simpson in their extended squad for the Rio Olympics. Wales centre Allen, Scotland centre Bennett and England scrum-half Simpson are in a 25-man party which will be reduced to 12. Uncapped Scarlets flanker James Davies, Harlequins back Ollie Lindsay-Hague and Newcastle's Marcus Watson are included. Team GB's women's squad of 23 includes 21 England players. Wales' Jasmine Joyce and Stephanie Johnston of Scotland are the only non-English players named. England sevens captain Tom Mitchell and Wales skipper Luke Treharne are among the sevens specialists in the men's squad. Although the likes of Allen, Bennett, Simpson and Davies are recognised 15-a-side players, they all have considerable sevens experience. Bennett and Davies represented Scotland and Wales respectively at the 2014 Commonwealth Games and both have also played in the Sevens World Series, as has Cardiff Blues centre Allen. "Exciting talent was available to us and competition for places was tough," said head coach Simon Amor. "We're now really looking forward to bringing this group together as one team and creating an incredible Great Britain spirit." The 25 players will meet on 30 May for a seven-week training period involving four international competitions, before the squad is cut to 12 in July. Great Britain sevens men: Cory Allen (Cardiff Blues), Mark Bennett (Glasgow Warriors), Dan Bibby (England Sevens), Tom Bowen (England Sevens), Phil Burgess (England Sevens), Sam Cross (Wales Sevens), James Davies (Scarlets), Alex Davis (England Sevens), Richard de Carpentier (England Sevens), Jamie Farndale (Scotland Sevens), Alex Gray (England Sevens), Charlie Hayter (England Sevens), Warwick Lahmert (England Sevens), Ollie Lindsay-Hague (Harlequins), Gavin Lowe (Scotland Sevens), Ruaridh McConnochie (England Sevens), Tom Mitchell (England Sevens), Luke Morgan (Wales Sevens), Dan Norton (England Sevens), Scott Riddell (Scotland Sevens), Mark Robertson (Scotland Sevens), James Rodwell (England Sevens), Joe Simpson (Wasps), Luke Treharne (Wales Sevens), Marcus Watson (Newcastle Falcons). Great Britain sevens women (all England unless otherwise stated): Claire Allan, Natasha Brennan, Abbie Brown, Rachael Burford, Heather Fisher, Victoria Fleetwood, Natasha Hunt, Jasmine Joyce (Wales Sevens), Stephanie Johnston (Scotland Sevens), Megan Jones, Alex Matthews, Fran Matthews, Sarah Mckenna, Katy Mclean, Marlie Packer, Alice Richardson, Emily Scarratt, Emily Scott, Michaela Staniford, Danielle Waterman, Joanne Watmore, Kay Wilson, Amy Wilson Hardy.